The SLK Ultima saddle is a serious piece of kit! A professional dressage saddle made from exquisitely soft, supple tactile leathers - the seat, pads and panel are made from the finest French Calf leather. The SLK Ultima features the unique SLK tree which is available in two profiles and two shape variations. The standard low head tree is suitable for the majority of horses and riders. The high head is contoured more steeply through the pommel for Thoroughbred-type horses that have very high, long withers. Precision moulded flaps provide riders with the highest levels of support needed to achieve peak performance. 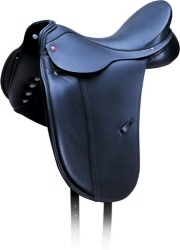 This saddle gives the feeling of improved comfort complimenting perfect balance and security. Albion’s SLK Ultima is the most luxurious dressage saddle that Albion have ever created. 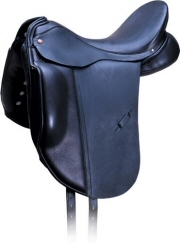 This saddle provides the ultimate in performance technology for both horse and rider. Indeed, the SLK Ultima was the choice of 2004 Badminton winner - William Fox-Pitt - and is endorsed by British Dressage team rider Carl Hester. The Albion SLK Ultima is the first choice of many of the world’s leading dressage riders. The Albion K2 is a classic dressage saddle and is one of the most established and best value dressage saddles that Albion have ever created. The K2 has a half cut back head and deep seat which provides a close contact feel with unrivalled support for the rider's position. It is extremely comfortable for both horse and rider. The K2 also benefits from many of the advanced technologies developed by Albion for their top of the range SLK and SLK Ultima models. 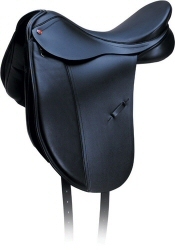 The K2 is a popular choice amongst dressage riders competing at every level world wide. The Albion SL is a professional dressage saddle and is made from the highest quality full grain leather. It offers a narrow seat providing riders with all the comfort and support they need whilst being an "open seat" it minimises any restriction of the rider's position or application of the aids. The Albion SL Dressage Saddle incorporates proven tree construction technology offering a wide panel support which in no way impedes the horse's movement or action and therefore maximises performance.